Happy Cyber Monday!! Did you know that 97 million Americans were expected to shop online today? I didn't...shop on line I mean. I baked, mostly, with some time out to do some regular, get in the car and drive to the nearest mall, shopping! Bad idea!! Anyhoo, I came across this recipe called Sticky Peanut Butter Cookie Bars when I realized I have tons of unsalted peanuts and I should start making something with them! 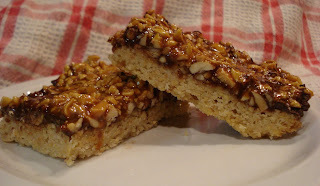 I had all the other ingredients needed to make these bar cookies, even the bittersweet chocolate, which is pretty unusual for me. I really don't care too much for bittersweet chocolate. Actually, if I made these again I would use semi sweet chocolate instead because the bittersweet really cuts the sweet, almost too much. Here's the line up for the shortbread cookie base. Peanuts, flour, sugar, kosher salt, butter. Pulse peanuts, flour, sugar and salt and in food processor til peanuts are ground and mixed well. Add butter and pulse til mixture resembles cornmeal. Press mixture into a glass baking dish. Bake til golden, about 30 minutes. Remove and place on wire rack to cool. Make topping. Sprinkle chopped chocolate over cooled shortbread base. Make topping. Combine sugar, salt and water in medium saucepan. Bring to boil over medium heat, stirring often til sugar is dissolved. Continue to boil, swirling pan occasionally ( but don't stir). And boiling...til it turns a caramel color...but watch it!! It turns and burns very quickly (yes, I had to throw out the first batch:( ). Remove from heat and carefully stir in the cream and vanilla...Be careful, it bubbles up a bit!! Stir the peanuts into the caramel mixture. Immediately pour over the shortbread/chocolate base. Spread over the chocolate. Sprinkle with remaining 1/2 tsp. salt. Let cool and cut into squares or rectangles. 1. Preheat oven to 350. Butter 8" x 8" glass baking dish. 2. Combine peanuts, flour, sugar and salt in food processor. Pulse til peanuts are ground and mixture is well combined. 3. Add butter pieces and pulse til mixture resembles cornmeal. 4. Press mixture into baking dish. 5. Bake til golden, about 30 minutes. 1. Combine sugar, 1/2 tsp. salt and water in medium saucepan. 2. Bring to boil over medium heat, stirring often til sugar is dissolved. 3. Continue to boil, swirling pan occasionally. ( Do not stir), til it turns a caramel color. 4. Remove pan from heat and carefully stir in cream and vanilla. 5. Sprinkle chopped chocolate evenly over cooled shortbread base. the back of a spoon. 7. Sprinkle remaining 1/2 tsp. salt over topping. 8. Let cool and cut into squares or rectangles. Before I go on about this tart, I'd like to thank Tiffany over at the National Cookie Network for featuring my cookie company Bucks County Cookie Co. on her blog last week. She has a wonderful blog, all about cookies with tons of recipes and great tips and ideas. So please go visit her ! I came across this recipe while I was digging through a box filled with old, torn from magazines and newspapers recipes. You know that box..we all have one! It has bits and pieces of this and that and recipes you just know you'll never make but you can't bear to throw out because ..you just never know when you might need or want to make something in there !! Like this one. This recipe is from an old newspaper article from The Philadelphia Inquirer from 1983. Guess it sounded good to me at the time I tore it out. It only took me 26 years to get to it !! 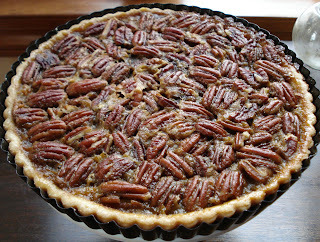 It's a lot lighter than a regular Pecan Pie and a lot thinner but that's what I like about it. Also the pate brisee is a wonderful buttery dough, almost like a shortbread. Begin by making the pate brisee ( sweet pastry dough). You will need an 11" tart pan with a removable bottom. Roll the dough to 1/8" thickness and place into the tart pan. Prick surface lightly with a fork and refridgerate or freeze for 20 minutes. When ready to bake, line the shell with foil and fill with uncooked rice or beans ( or again I'm using my legumes...all I had!). Bake 25-30 minutes at 375. To make the filling, put eggs, sugar, salt, vanilla and brandy extract, (if using. I didn't) in medium size mixing bowl. Add syrups and blend with wooden spoon. Add butter and mix with wooden spoon. Do not beat. Pour into baked tart shell. Spread pecans evenly over mixture and bake at 350. 1. Combine flour, sugar and salt in food processor. Process to blend. 2. 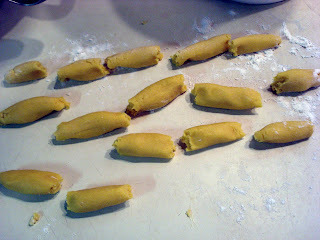 Add butter and shortening in a few quick pulses, til mixture has a coarse texture. Do not overblend. 3. In a small measuring cup, blend together egg and ice water, mixing lightly with a fork. 4. Pour egg mixture over flour mixture in processor. Process til a ball forms around the blade. 5. Roll dough into a ball, then flatten into a 1/2 " thick disc. Wrap in plastic and refridgerate several hours or overnight. 6. Roll dough on a floured surface to 1/8" thickness. Fit into an 11" tart pan with removable bottom. 7. Prick surface lightly with fork and refridge or freeze 20 minutes. 8. When ready to bake, line shell with foil and fill with beans or uncooked rice. 9. Bake at 375 for 25 to 30 minutes. Cool for 5 minutes before removing rice and foil. 1. Put eggs, salt, sugar, vanilla and brandy extract in medium size mixing bowl. 2. Add syrups and blend with a wooden spoon. 3. Add butter and mix with a wooden spoon. Do not beat. 4. Pour into baked tart shell. 5. Spread pecans evenly over mixture. 7. Cool and remove metal sides from pan. Garnish with confectioners sugar or whipped cream. 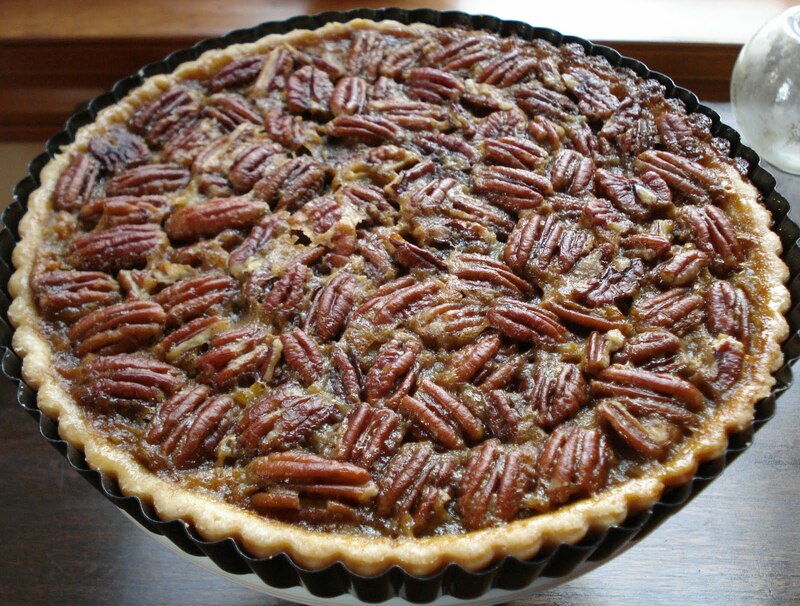 I've been baking all day...pies especially...and when I called my daughter in law to ask what kind of pie I could bring her and my son this Thanksgiving she said...well Jim doesn't like pecans or pumpkin. Yikes...how'd I not know that!!? She reminded me he likes chocolatey whipped creamy kind of pies. So the first thing that came to mind was a chocolate mousse recipe I've had in my stash for...let's see..about 25 to 30 years now!! I figured if I blind baked a crust and filled it with this amazing chocolate mousse and then topped it with fresh whipped cream...WOW that would be great!! And it is!! And topping it with freshly whipped cream really makes it special. I urge you to try this. Even if you don't make it into a pie. Just spoon some into a pretty glass and top with whipped cream. Or just eat it out of the bowl!!! Kidding:) !! The ingredients all ready to go. Heat water and half of the sugar til dissolved. Once it boils, remove from heat and beat in chocolate pieces til melted. Let it sit. Separate the yolks from the whites. Put the whites in your standing mixer bowl. Start beating the whites with the cream of tartar til firm. Gradually beat in remaining sugar til stiff peaks form. Beat yolks, coffee and vanilla into cooled chocolate. Add a small portion of the stiff whites into the chocolate mixture and stir. This will lighten the chocolate mix. Gently fold remaining whites into the mixture. Don't overmix. It's okay to see a few remaining white streaks, but just barely. At this point, if you will be not making a pie, spoon the mix into pretty glass dessert bowls or tall glasses. If you are going to make it into a pie, just refridgerate mix til ready to fill pie crust. Blind bake using your favorite pie crust recipe.Prick the crust all over to prevent it from bubbling and puffing up. Place foil on top of crust before baking and fill with dried beans ( or legumes in this case..ok, it's all I had !) and blind bake crust . Oops..time out !! Took this shot of the newest and 4th member of my sons St. Bernard family!! This is Zeus...isn't he cute?! And he's just a puppy!! Looks like he wants a piece of that pie!! No way, mister!! Of course we have to bake the scraps...for taste testing, you know!! Let the crust cool completely before adding the mousse. Perpare your favorite pie crust recipe, blind baked and cooled. 1. Heat water and 1/2 cup sugar in saucepan til dissolved, then bring to rolling boil. 2. Remove from heat and beat in chocolate pieces til melted. Let sit. 3. Separate eggs placing whites in standing mixer bowl. 4. Beat whites with cream of tartar til firm. 5. Gradually beat in remaining 1/2 cup sugar til stiff peaks form. 6. Beat yolks, coffee and vanilla into cooled chocolate mixture. 7. Take a little bit of the whites and stir into the chocolate mix. to lighten it up. 8. Gently fold remaining whites into chocolate mixture. Do not overmix. 9. Spoon mixture into completely cooled pie shell and top with freshly whipped cream sweetened with a little sugar. Sprinkle the whipped cream with a touch of cocoa if you'd like. 10. Refridgerate til serving time. Back in August when I was visiting relatives down in Florida I asked my 91 year old Aunt Hilda if she had any old recipes she would be willing to pass on to me, specifically, cookie or cake recipes! She disappeared into the kitchen for a few minutes and came out with a few" oldies but goodies!" She is the only remaining relative from that generation on both sides and if anyone would have any old family recipes left, it would be her! Growing up we would always spend Christmas with my Aunt and Uncle in New Jersey and I have many fond memories of those times past...along with remembering her delicious cookies!! This Date Pinwheel cookie recipe, as you can see from the photo, is an old one from Woman's Day Magazine. 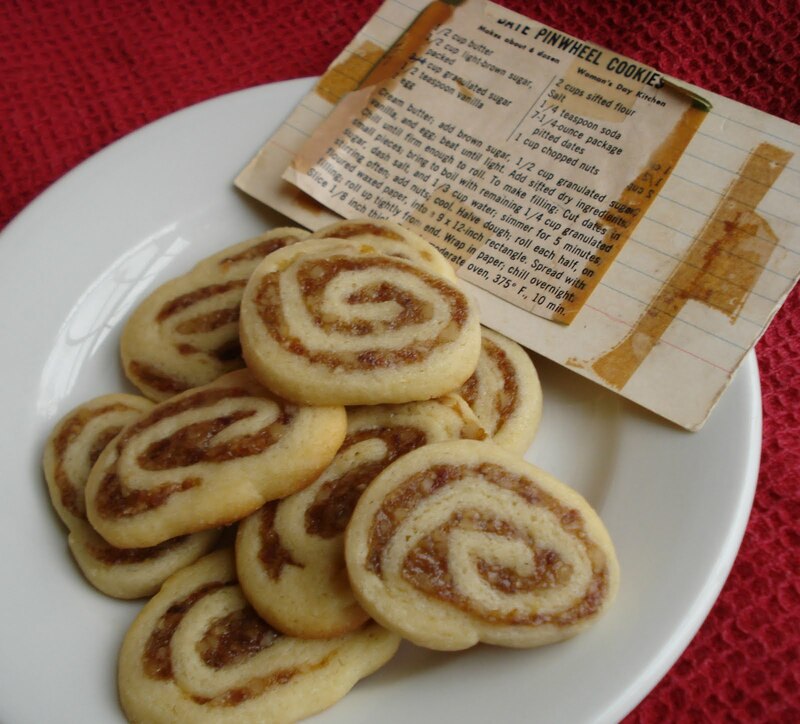 It probably should have been named Date Nut Pinwheel Cookies. What year, I don't know, but I would gestimate around the 1960's?! It's a simple recipe with few ingredients, unlike those I've researched online (sometimes less is more!). The cookies have a wonderful date flavor and they're not too sweet. I found working with the dough was not too bad but I tend to roll my doughs out too thin, no matter whether it's a pie crust or cookie dough. I just like a nice thin flaky dough. But with this recipe it's better not to roll it out too thin, about 1/8 inch thick and definitely between 2 sheets of floured waxed paper! Also another tip, I found that once the cookies are rolled up and wrapped in waxed paper, freeze them , placing them into a ziploc bag, rather than just putting them into the fridge. The dough tends to be a bit soft. They slice and bake much better this way. And you can bake them whenever you like since they keep well in the freezer. So, give them a try!! Cream butter: adding brown sugar, 1/2 cup granulated sugar, vanilla and egg: beat til light. Cut dates into small pieces ( I took mine for a spin along with the nuts in the food processor); bring to boil with remaining 1/4 cup granulated sugar, dash of salt and 1/3 cup water. Simmer for 5 minutes, stirring often. ( I only simmered for about 2 minutes). Add nuts. ( Mine were already in with the dates). Cool. Halve dough. Roll each half on floured waxed paper into a 9" x 12" rectangle (Mine was kind of a rectangle about this size!). Spread with filling. ( With a light hand or else the dough might break!). Slice 1/8" thick. ( I lined my sheets with parchment paper). In my constant search for a cookie or biscotti loaded with spice flavors, I came upon this Gingerbread Biscotti recipe. If you like a lots of warm and mellow flavors then you need to try this one! 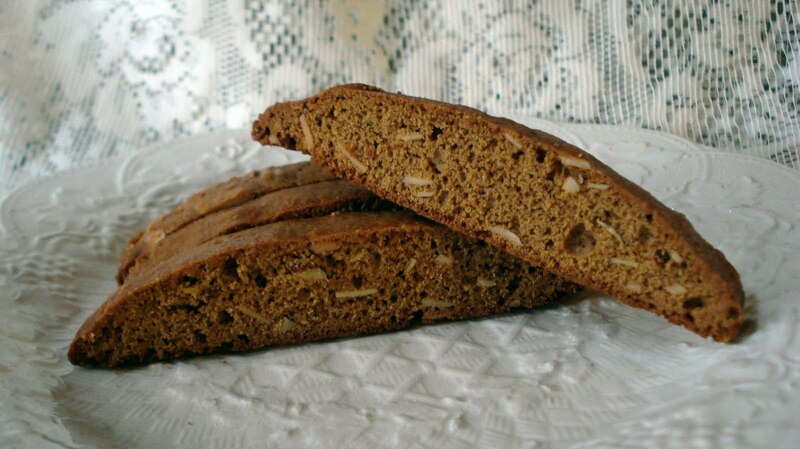 It's an easy recipe and the second baking time gives the biscotti a nice crunch. The original recipe also called for drizzling each with white chocolate. I didn't do this but it would certainly"gild the lily"! The logs, ready to go into the oven. They look beautiful already !! 1/2 cup butter- room temp. 2. Beat sugar, butter and molasses til smooth. 4. In med. bowl, combine flour, baking powder and spices. 5. Add flour mix. to wet ingredients. Stir to blend. 7. Scoop dough onto baking sheet and pat into 2 logs ( or 4 logs for smaller biscotti). 8. Make logs - 2" x 1/2" thick. 10. Let cool and rebake 15-18 minutes, turning halfway through. 11. If drizzling with chocolate, melt white chocolate chips in double boiler and drizzle over completely cooled biscotti. These biscotti will keep well in an air tight container for a week or two...if they last that long! I'm not really sure how I came upon this recipe. Another one of those times when I kept clicking and getting deeper and deeper into other sites and before I knew it I found this Oatmeal Raisin cookie recipe from Starbucks. Apparently they were giving out the recipe at the stores. Now, I am one to never ever buy a cup o' joe at Starbucks. It just goes against my grain, and pocketbook, to spend that kind of money for a cup of very strong java. And..guess what?.. 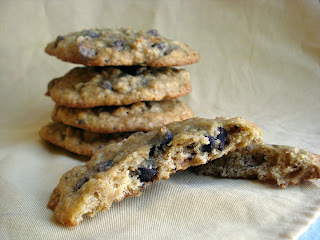 I believe I have a great oatmeal raisin cookie recipe so why did I decide to try a new one?? Just curious !! So, I did make some changes. The original recipe only called for one spice, cinnamon. I make mine with lots of spices so I added just a pinch of nutmeg and cloves. They came out flat, which is okay but when my son, Kris, ate one he said he's seen them at Starbucks and they are fatter! What... who's drinking Starbuck coffee in this family?!! Anyway, he did say they were really good. To address the flat cookie issue, I think a bit of oatmeal flour ( made by putting some oats into a blender and making it fine, with a flour like consistency) into the batter with the flour would help to fatten them up. You're supposed to sprinkle dark and golden raisins on top before baking. I say...why?? There are quite enough cranberries and raisins in the cookie..but I sprinkled! So I did like the flavors once I played around with more spices. I made mine bigger than most and the cooking time took a few minutes longer. Just remember to take them out before they look done. They almost look slightly underdone in the middle when they need to come out of the oven. That's the secret to a good oatmeal cookie like this. Don't overbake!! 4 tbsp. each of dark and golden raisins. Preheat oven 350. Line baking sheet with parchment paper. 1. Blend first 7 ingredients. Set aside. 2. Beat butter and sugars til light and fluffy. 3. Add egg, spices and vanilla. 5. Gradually add oat mixture, beating til well blended. Drop by rounded tablespoonfuls 2" apart. Place mounds of raisins on top of each cookie. Bake 12 - 16 minutes. Cool on baking sheet 5 minutes. Transfer to wire rack to cool. I've been intrigued lately with recipes using Chinese 5 Spice powder so I headed down to a local store that carries a wonderful selection of unusual spices and bought a small bag. Having never used this interesting spice before I searched for what sounded like a perfect recipe for something sweet using this 5 spice powder. Although recipes for barbeque sauce with this spice mix do sound very good! (I'll save that for another day!) The 5 spices making up this powder include star anise, fennel, cloves, cinnamon and ginger. The fragrance and aroma of this spice mix is so wonderful. I could smell it every time I entered my kitchen! (Do you suppose it could be made into a perfume?!! Eau de 5 Spice ?!!) Kidding!! Anyway, back to the cupcakes. This recipe is adapted from a "Bonappetit" recipe originally called "Four Layer Pumpkin Cake with Orange Cream Cheese Frosting". The original recipe also called for walnuts for decoration. We're not big walnut lovers here so I left them out but feel free to include them if you love walnuts. You could even put some into the batter. I decided it would be fun to turn them into cupcakes so that's what I did and they came out just great! The orange frosting just on it's own it amazingly delicious!! I think it would be fabulous on a gingerbread cake,too. 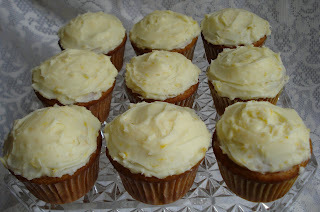 The cupcakes had a nice subtle flavor of the chinese 5 spice with the pumpkin. So give them a try. This would be a great Holiday treat. Small, bite sized and totally delicious!! Had to take a bite to show you the inside !! Adapted from "Bon appetit"s Four Layer Pumpkin Cake with Orange Cream Cheese Frosting"
2 stick unsalted butter-room temp. Perpare 2 muffin pans lining with paper cups. ( Makes about 2 dozen). 1. In medium bowl, whisk flour, baking powder,baking soda, chinese 5 spice powder and salt. 2. In bowl of standing mixer, beat butter and sugar til smooth. 5. Add dry mix to butter mix in 3 additions alternately with milk in 2 additions. Beat in between additions. 6. Using scoop, place batter into muffin lined pans filling each about 3/4 amount full. Bake approx. 15-20 minutes, checking after about 15 minutes for doneness by inserting a toothpick to see if it comes out clean. 2 - 8 oz. pkgs. cream cheese - room temp. Chopped toasted walnut for decoration( if using). 1. In a large bowl, beat butter and cream cheese til smooth. 2. Stir in orange zest. 3. Add powdered sugar and beat on low til all is combined and smooth. 4. Frost cupcakes and decorate with walnuts if using. When life hands you overripe bananas...make banana cookies ! !..Sorry, I know that's lame but when you have too many of these past their prime fruits hanging around you have to think quickly to use them up. So I threw a few into the freezer ( peel the skin off first or else you'll be sorry!) to make smoothies at a later date and I still had some left over so Martha Stewart's cookie recipe came to mind. I'd made it before and remember liking it. I didn't have any chocolate chunks so I just used chocolate chips so the real name for these is Banana Walnut Chocolate Chip Cookies. If you like a soft cookie, then this one's for you! It's almost like eating a piece of banana bread, it's that soft. The walnuts add a nice crunch and the chocolate just plain tastes great with the whole banana nut combo. Mix the butter and sugar in standing mixer bowl. Add egg and vanilla, then banana, then flour mixture. Stir in oats, chocolate chips ( chunks) and walnuts. Drop scoopfuls onto baking sheet. 3/4 cup ( 1 1/2 sticks) unsalted butter -room temp. 1. Whisk both flours, salt and baking soda in a medium bowl. 2. Put butter and both sugars into bowl of standing mixer fitted with paddle attachment. Mix on medium speed til pale and fluffy. 3. Reduce speed to low and add egg and vanilla. Mix til combined. 5. Add flour mixture;mix til just combined. 6. Stir in oats, chocolate chips ( chunks) and walnuts. Using a 1 1/2" ice cream scoop, drop dough onto parchment lined baking sheets spacing 2" apart. Bake 12-13 minutes, rotating sheets halfway through. Cool cookies on sheets 5 minutes. Transfer to wire racks and cool completely. Cookies can be stored in airtight container at room temp. up to 2 days. Ok, I know the title of this post is "Iced Italian Anise "S" Cookies" and that picture above isn't quite an "S" shape! It isn't even close! But, I kind of really liked the cookie in this straight shape and so, that's it. My explaination, plain and simple! Now, as for the recipe. Well, I have been looking for a good, plain Italian cookie recipe for a while now. I was shopping at a local outlet store that has a pretty decent kitchen department when I came across a Christmas cookbook put out by a very well known cake decorating , food crafting company. So as I flipped through the book I came upon this recipe. Well, I didn't need all the other recipes in the book...just that one! So I jotted it down. Right there in the store! Ok, there, the truth is out! This wonderful, soft, mild tasting cookie provides a perfect "canvas" for the easy sugar glaze and sprinkles that decorate the top. 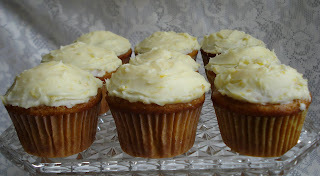 The original recipe calls for anise extract and the first time I made them, that's what I used. But I got to thinking that perhaps replacing the anise with orange or lemon flavoring might be interesting, so that's what I did for these. The result is a mild orange flavor. Next time I'll try the lemon flavor. I think that will have more "punch"! One note: I cannot remember what sort of glaze the original recipe used. ( I actually only wrote down the ingredient list). So, I made up my own. Beat softened butter and sugar in a standing mixer bowl. Add eggs and extract. In separate bowl, whisk flour, baking powder and salt. Slowly combine with egg/butter mixture til just incorporated. The extreme orangey color of my batter is due to the wonderful farm fresh eggs my friend was so kind to give me. Aren't they beautiful?! On a floured work surface, take out a small handful of dough at a time and roll on the work surface to form long logs about 1" wide. Tear apart the logs about 3" long and place on prepared baking sheet. ( At this point you can shape into the "S" shape if you like. Bake and when done, let cool on baking sheet a few minutes, then transfer to wire rack to cool completely. Once cooled, make glaze and decorate with colored sprinkles. Preheat oven to 350. Line sheet with parchment paper. 1.In bowl of standing mixer beat butter and sugar about 2 minutes. 2. Beat in eggs, one at a time. Add extract. 3. In a medium bowl, whish flour, baking powder and salt. 4. Slowly add dry ingredients to wet mixture and stir til all combined. 5. 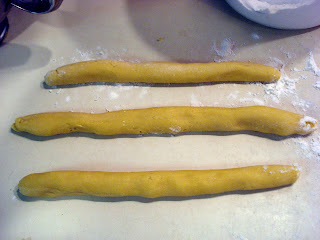 Lightly flour your work surface and take small handfuls of dough at a time and roll into logs about 1" wide. 6. Tear or cut the pieces into smaller 3" long pieces. 7. Place on a parchment lined baking sheet and bake about 10 minutes. ( Mine took quite a bit longer. More like 15 - 20 minutes). 8. Let cool on sheet for about 5 minutes. Then transfer to a wire rack and cool completely. Place about 1 cup of confectioners sugar into a small mixer bowl. Add enough milk to make a smooth fairly thin glaze. Using a teaspoon, place a small amount onto a cooled cookie top and spread with spoon. Immediately decorate with colored sprinkles. If using orange or lemon, just replace the milk with orange juice or lemon juice. Use just enough to make a thin glaze.